Residents can help to improve lake and stream water quality through responsible environmental stewardship. It starts with proper care and maintenance of onsite waste water septic treatment systems, picking up pet waste, eliminate lawn fertilization near lake shores and discourage feeding or attracting waterfowl to your lawn. A lawn herbicide for controlling weeds and crabgrass that does not contain fertilizers is Spectracide Weed Stop at about $12.75/bag that covers 5000sq. ft. It is sold at both Home Depot and Meijers. 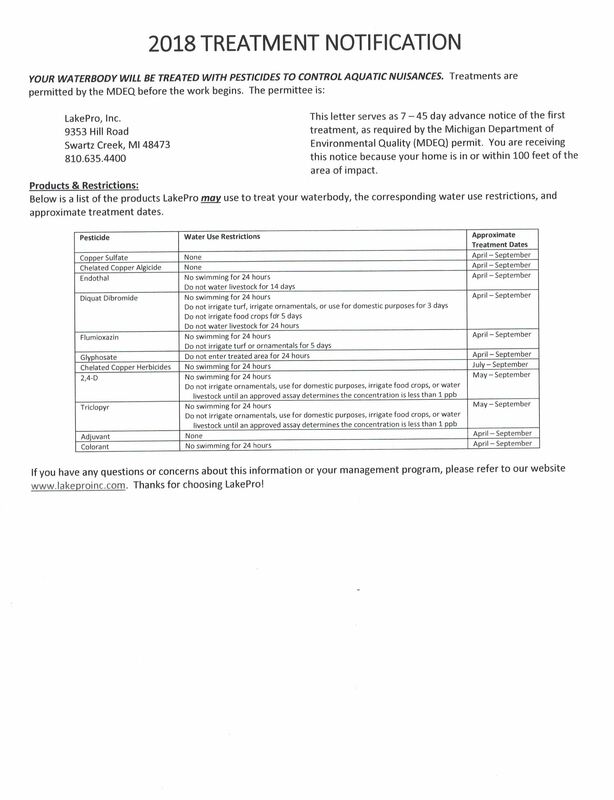 In 2016 the Lake Manitou Association began in-lake and stream water E. coli testing as it is a bacterial product of animals and humans that in high enough concentrations can be a public health hazard. Lake Manitou in-lake shoreline water results are below Michigan Department Of Environmental Quality (MDEQ) standards for closing beaches or partial or full body contact. Shoreline water testing will continue. Excessive amounts of phosphorus, nitrogen and soil sediment entering Lake Manitou from the Hardy Jennings Drain is a primary catalyst to the lake algae growth. Blue green algae can produce a bacteria called microcystin that, in high enough concentrations can be harmful to humans and pets. Algae studies in 2017 by Oakland University measured mycrosystin as low, however, dense algae concentrations should be avoided.